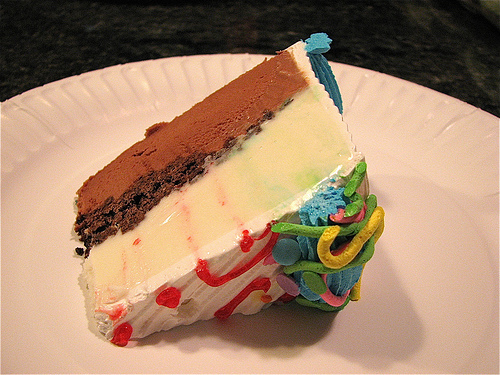 when i was little, carvel ice cream cakes were super popular for birthday parties. 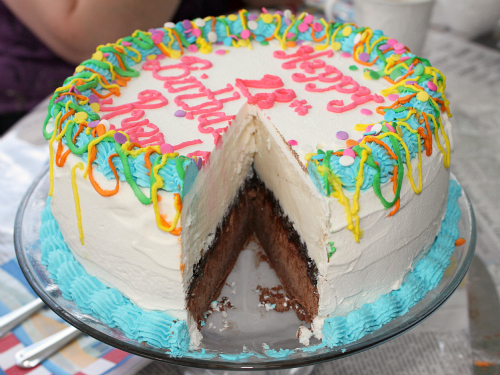 i can still remember the classic design of the colorful icing and the signature chocolate cookie crumb layer inside like it was yesterday. for ryan's birthday party this year, i made an ice cream cake for dessert fashioned after the carvel ice cream cakes from our childhood. ryan's ice cream cake had a layer of homemade chocolate ice cream and a layer of homemade vanilla ice cream with chocolate fudge and cookie crumbs in the middle, then the entire cake was covered in frozen whipped cream. it was absolutely delicious and brought back so many good memories. 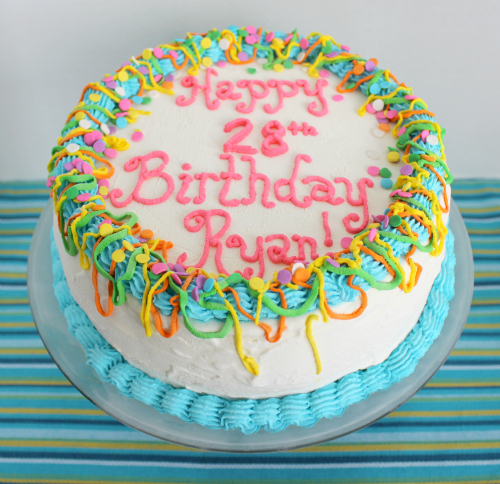 ice cream cakes are so easy to make, they simply require a bit of time in order to freeze each layer. you can use any flavor ice cream you like, and you don't even have to make homemade ice cream. store bought ice cream works too. to make the vanilla ice cream: in a large bowl whisk together all of the ingredients with a hand mixer on low speed for about 1 to 2 minutes, or until the sugar dissolves. using a 2 quart ice cream maker, turn the machine on and pour the mixture into the freezer bowl. (the freezer bowl must be already pre-frozen.) let the mixture mix in the ice cream maker for about 25 to 30 minutes, or until thickened. line a 9-inch round cake pan with plastic wrap. transfer the ice cream to the pan, and cover the top with plastic wrap. freeze for about 2 hours, or until the ice cream is completely frozen. to make the chocolate ice cream: follow the same directions. to make the chocolate cookie crumb filling: place approximately 12 chocolate wafer cookies in a ziploc bag and crush the cookies with a rolling pin to make small crumbs. in a bowl, combine the cookie crumbs and 2-3 tablespoons of chocolate magic shell (just enough to allow the cookie crumbs to stick together). set the cookie crumb mixture aside until you are ready to assemble the ice cream cake. do not refrigerate. 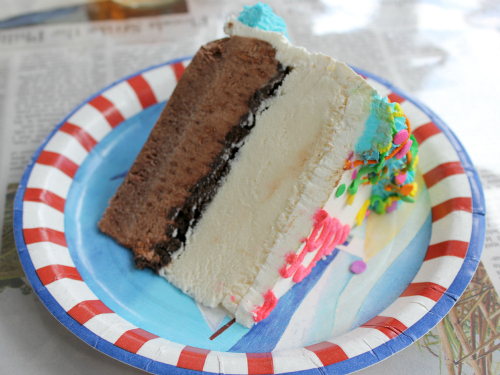 to assemble the ice cream cake: once frozen, place the chocolate ice cream layer on a cake stand. spread chocolate fudge evenly on top of the chocolate ice cream layer. spread the cookie crumb mixture evenly on top of the fudge. place the vanilla ice cream layer it on top of the cookie crumbs. freeze the ice cream cake for about 1 hour. once frozen, cover the cake with a thin layer of whipped cream. freeze the ice cream cake for about 1 hour. 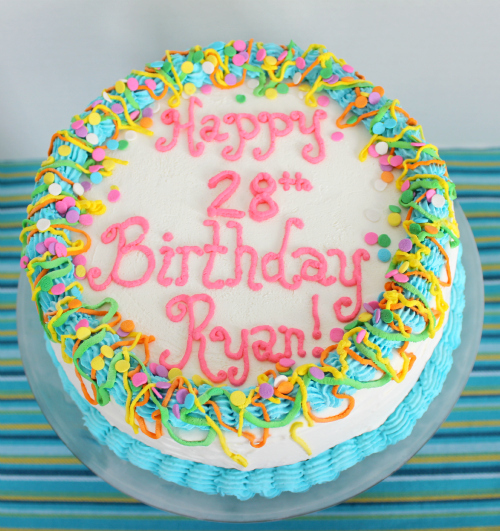 cover the cake in a second layer of whipped cream and decorate. freeze the cake for at least 2 hours before serving. So impressed that this is homemade!